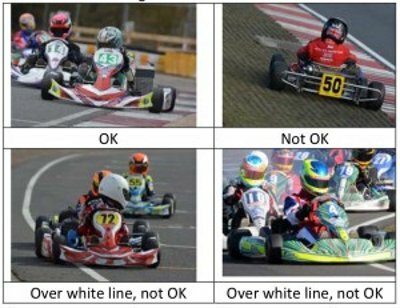 For 2016 the ‘Car’ regulations for track limits detailed in MSA Blue Book regulation Q14.4.2 will be applicable for karts, and any driver leaving the track more than twice may be excluded from the meeting. The regulation begins with “Drivers must use the track at all times and may not leave the track without a justifiable reason”. Q14.4.2 goes on to state that the white lines defining the track edges are considered to be part of the track, and that a driver will be adjudged to have left the track if any wheel goes beyond the outer edge of any kerb or goes beyond the white line where there is no kerb. Please feel free to get in touch with your suggestions and feedback for our club website.